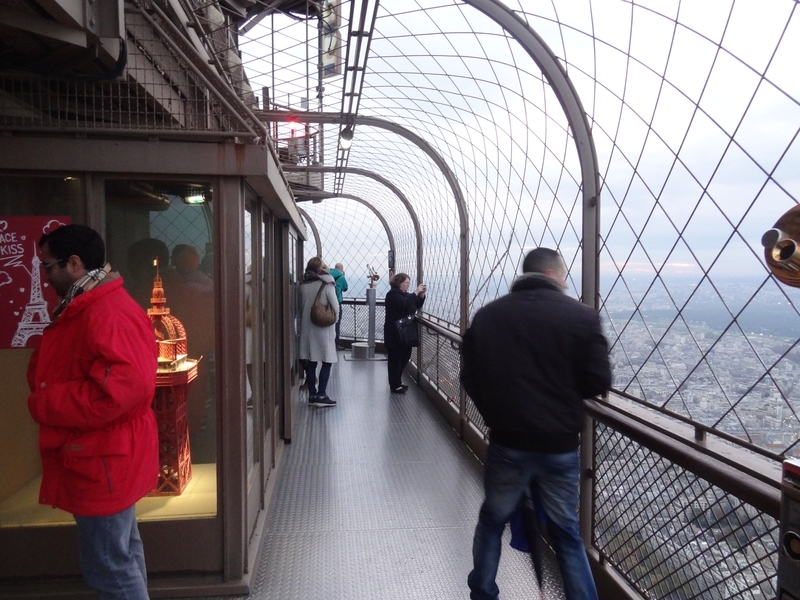 The 3rd floor of the Eiffel Tower is the highest floor accessible to the public. From high up, there is little more than the technical installations dedicated to the radio and tele-diffusion. It is a floor on 2 levels, there is a closed room and above, a gallery around the monument and some curiosities. How to go up to the 3rd floor of the Eiffel Tower? What is the price of the ticket ? What is there to see on the 3rd floor? These are all questions whose answers are below. To access the 3rd floor, you have no choice: You will have to take the elevator. Indeed it's been years that the staircase has been condemned for everyday use, our day it serves only as an emergency exit. You must take the ticket on the ground floor, it must include the climb to the top, otherwise it is a standard ticket only allowing the climb to the 2nd. When you're in 2nd, I think you will not be able to buy tickets for the summit, it will be too late. This is the very structure of the Eiffel Tower which is like that, the lifts start from the ground and climb to the 2nd with a stop at the 1st, and from there you take another elevator that goes up vertically to the 3rd. (The first lifts being oblique, they follow the curve of the tower) In fact, there are 4 elevators rising at the top, two double-cabins. While one climbs to the top and the other goes down, they work in pairs. One is red, the other yellow. The cabins are rectangular, real boxes of sardines, and the comparison is quite fair by high affluence. The poor liftier is as tight as the visitors, when there are people, despite his protection bar. The elevators are glazed, which allows to see the landscape that rises more and more. By being attentive we see the passage at the intermediate floor, which it does not stop of course. The view is very regularly cut by the beams of the caissons format the tower, as well as by the spacers, but it is not really annoying for the sight. The climb is done in a few seconds, about thirty or so. Arrived at the top, the ports open directly into the room of the third floor, unique room on this level. The space between the central part and the outer walls is 3m25, which leaves a lot of room to walk, even if, by high attendance, it is still the crowd. By a simple calculation, we deduce that the central part is 10m side, 100m2. The walls are equipped with large windows that offer a panoramic view of Paris and its region. The view is very far, the visibility of the top of the Eiffel Tower was calculated accurately and confirmed by the observations. Here, we do not have a sensation of height because we are in a closed room, we feel like we are safe. Above the windows there is an interesting 360 ° path leading to the main cities of the world, as well as the most emblematic monuments: The Taj Mahal, the Statue of Liberty, the Corcovado, etc. In each corner there are signs showing old photos. They are related to the history of the tower. There is, for example, a cliché of the principal engineers, the personalities who visited the tower, the scientific experiments which allowed the survival of the monument, etc. At two places in this room there is a staircase to the upper level. Protected by a full glass racks, they cause a small flow of air unpleasant but preventive, because it denotes the weather above: The colder it is here, the colder you get up there! Formerly these stairs did not exist, we used the spiral staircase leading to the office of Mr Eiffel, upstairs , which still exists but is doomed. The four galleries that run around are protected by a normal railing, but surmounted by a thick mesh with wide mesh (to let the eye) that passes over and is anchored in the walls of the tower. Thus we are completely locked in a cage of wire, which makes it possible to avoid the accidents. The view is not affected too much. A 3D representation of the installation of the air pressure gauge. It refers to the scientific experiments that were made on the tower. All of these are described below, but by going around you will not fail to look up to see the technical installations of radio and television broadcasting of the tower. From there you are just a few meters below, and there is another room above, but it is inaccessible to the public, it contains the devices for the proper functioning of multiple antennas. The top is bristling, there are really a lot of parables, cylinders, and various wires up there, and that's where you look. Another surprising element is the lightning rods. There are 4 important at the top of the tower, we can hardly see them looking up, but there are 8 others around the 3rd floor, more simple. These are slashes terminated by 8 very sharp points, arranged 2 by 2 on each side. They complete the 4 main lightning conductors and are regularly struck by lightning, which justifies the closure of the 3rd floor in case of storm. Before going on to the description of each element, here is the text written by Gustave Eiffel in 1900 describing the 3rd floor of his tower. It is quite technical, but explains well how was this floor to its construction. First of all here are the technical plans of the 3rd floor, they were the ones who served for the realization of the monument. (All the planks are available here on this site. The third platform has its floor at +309.63; it forms a closed room, whose central part is occupied by the Edoux elevator, and by the four pillars which extend to the lower part of the large diagonal beams of the summit. The square occupied by these four pillars is 10 m wide. On the periphery reigns a corbelled promenade-gallery with sloping angles, 3.25 m wide, supported by the large consoles of the coronation. The width is 16,50 m and the surface is 251 m2. The floor is made of contiguous 0.08 m planks placed on iron joists and covered with asphalt. The promenade gallery was raised by 0.18 m with joists and a 25 mm parquet floor covered with linoleum. The perimeter is occupied by a wall of wood and iron, forming a railing 1.20 m high, surmounted by openings that receive movable windows that can be raised or lowered depending on who wants to be or not preserved from the wind that usually prevails at this height. It is through these openings that visitors can contemplate the panorama in front of them and whose perspective drawings placed above the openings represent the most remarkable points. The layout is complemented by small shops arranged between the pillars and the elevator shaft, in which souvenirs of the Tower are sold. The ceiling is formed by the underside of the floor of the reserved pavilion and the upper gallery, which is accessed by a small winding staircase. The ceiling height is 2.50 m.
The upper part consists of a square wooden pavilion of 10.50 m side, surrounded by a gallery with slabs 2.77 m wide. This open-air tunnel, located at the elevation 312.21, is equipped with an up-to-date railing and a skeleton floor; it receives the way Decauville, used to move the two projectors Mangin, and is filled with benches, from which one can enjoy all the beauty of the immense horizon. The pavilion includes, in addition to the location of the extended elevator shaft, a reception room with bathroom, kitchen and water closet, as well as four small laboratories for the scientific experiments of electricity, meteorology, physics and physiology (see Plate XIX, Fig. 6). The height is 2.27 m; the roof, almost horizontal, is filled with lead. The walls are double and fitted with mineral cotton inside for the apartments to be protected from the weather. From the gallery, the staircase leads to the campanile and the lighthouse. All this part was not accessible to the public during the Exhibition; Since then, Mr. Eiffel has, on certain days, given free access to the public, and a special staircase has been recently set up for this purpose. Along the gutter which reigns around the gallery are inclined paragliders; a beak of gas in frosted globes illuminated the upper part of the Tower. The water supply was through a small tank that ended up driving the spring water Worthington pump. The inner dwellings were lit by electricity, and a telephone connected the apartment to the central telephone of the Tower which communicated itself with the public network. 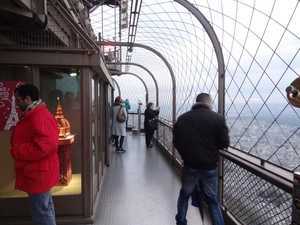 What is there to see on the 3rd floor of the Eiffel Tower? The highest point of Paris, the 3rd floor of the Eiffel Tower is of course the ideal place for the view of Paris and its region. From here the view is up to about 85Kms, but in theory, we should be able to see points at 126.5 Kms, if there were at an altitude of 300m high. But as there is none, we must be satisfied with a visibility 85Kms, which is not bad. 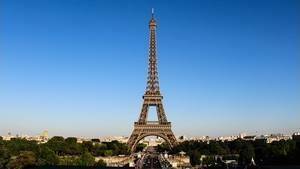 You have a study on the view range of the top of the Eiffel Tower, accessible on this site. On the 3rd floor there are two observatories. The first is in the lower room, the windows all around are large and allow to see Paris, while staying warm. The disadvantage is that we are limited to see the foot of the Eiffel Tower, the view is blocked. The other place is the upper gallery, where we are in the open air. From there you can see almost at the foot of the tower, and that's probably the most impressive point of view. On a clear day we can see the Paris region, the inhabitants will be happy to identify their cities, but the most interesting is also to find the main monuments of Paris. Some are obvious, like the triumphal arch or the Sacred Heart, but finding the Pantheon is already more difficult. You have spotting scopes (paid) to help you. It is a frieze running around the lower level room, it is placed above windows so that we can see it from everywhere, without having to be near the windows. It shows the direction and distance of the main cities of the world, as well as the main monuments. As this frieze goes around the room, we have a 360 ° description of the horizon, scanning the whole Earth. It's informative and fun, but it's still not that original. This model is in a glazed space behind a staircase leading to the lower level. 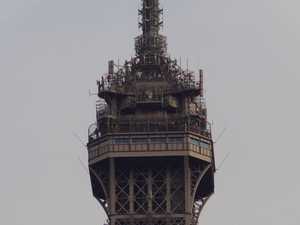 It measures approximately 80cm in height and what strikes the first approach is its red-brown color which is the original color of the tower, in 1889. Then we see that it does not have any shape at all that we know. The summit was at the time formed by two semicircular arches intersecting at 90 ° supporting three successive platforms, the last leading to the flagpole. The most attentive will notice that the level where they are is much narrower than at the time, it is due to the various later arrangements which reduced the space to circulate. Moreover this space was occupied, as it is said in the book of Gustave Eiffel reproduced just above ("Description of the 3rd floor in 1900, by Gustave Eiffel"), the gallery was occupied by a way Decauville, a kind small railroad to move Mangin projectors on trolley. These projectors were very powerful, they had the ability to illuminate a large area around the tower. The current lighthouses that sweep the Parisian sky at night are a tribute to this historic system. The model also has the merit of showing that the Eiffel Tower is made of caissons. A caisson is an empty cube whose sides are made of beams. Other beams, called spacers, consolidate the whole by connecting the angles between them. The Eiffel tower is a stack of boxes, there are 29 layers, the first 5 on the 1st floor, the next 12 on the 2nd, the other amount on the 3rd. On the model we see the 27th, 28th and 29th caissons. Otherwise, the appearance of the third floor has not really changed since the nineteenth century, especially its summit has been changed. To note the presence right next to a descriptive panel of the model, it takes again the elements which I just described bringing some precisions, like the number of shops of the time, namely, 6. It also indicates the place where were the meteorological instruments (On the penultimate platform). The office of Mr Eiffel is a room he had reserved at the top of the tower, to welcome visitors for example. It is a rectangular room large enough that he had arranged in office. It was equipped with a bathroom with toilet, which was not that common at the time. The current representation does not fully conform to what existed in 1900. Visible from the outside only, the office has been truncated to gain space for other functions. It is decorated in the fashion of the nineteenth century, and has 3 mannequins. One of Eiffel, represented in discussion with Thomas Edisson, and the third is the daughter of Mr Eiffel, Claire, represented standing with a fan. This scene is the reproduction of a real encounter, a day in 1889 during which Thomas Edisson offered Eiffel a copy of his invention, the phonograph. This phonograph present in the scene, it is placed on a dresser, between the two men. In the scene there is also a small piece of furniture which one can reasonably believe that it belonged to Eiffel, the two armchairs, and three frames on the wall. One represents the viaduct of Garabit, the other the dome of the observatory of Nice, two major works of Eiffel and the last is written in Asian ideogram, I do not know its meaning. Various period objects occupy the space. The carpets and tapestries are of the style of the nineteenth century, very loaded, but true to what it was at the time. Claire is in front of a couch that we see quite badly, partly because of the double-sloped beams that cross the room in front of him. This scene is visible only from the outside through 3 relatively small windows, it's a shame because the interest is both historical and entertaining. It should be noted that the office was larger and perfectly rectangular at the time, nowadays it is truncated and smaller, the rest of the space being used for other isntallations. Although little emphasized this office is interesting to see and, I imagine, surprising for those unaware of its presence at 300m from the ground. Otherwise the champagne bar is quite small. Modern orange-dominant, the bottles are aligned on shelves in the back of the server. The latter draws his goods in cartons under the counter, but we must admit that at the end of the day it becomes a little messy. In addition the communication door, behind him, is sometimes open, which spoils a little class style that gives this bar. It is not a big deal, however, those who want it can not sit down, there are no tables here (for lack of space), so amateurs wander in the galleries, or even down to the lower level , to keep warm. This plaque was affixed to remind the establishment of the tricolor flag on the Eiffel Tower in August 1944, Paris being released. Here is the full text. Here, August 25, 1944 under the orders of Captain SARNIGUET, Sergeants Henri DURIAUX, Pierre NOEL, corporal Charles ROUARD, sappers Marcel CONVERSY, André TAILLEFER, of the regiment of fire-fighters of PARIS hoisted the tricolor flag in the capital still busy. This text is engraved on a plaque next to the coat of arms of the firefighters of the city of Paris, which represents the ship on the coat of arms of Paris on a badge of firemen, classic. For the anecdote, this flag was made with 3 sheets of 3 colors, sheets sewn roughly. It is a panel of 5 columns, each presenting a great date in the history of telecommunications. He is bilingual, and here is his text. Introduction: From the outset the telecommunication antenna function saved the tower from programmed destruction and has continued to develop until today. 1898: E. Ducretet and E. Roger make the first link of TSF from the top of the Tower. Industrial and scientific French specialist in the construction of physics instruments, E. Ducretet participated actively in the development of the T.S.F. 1904: On proposal of G. Ferrié the direction of the Engineering authorizes the post of T.S.F. of the tower thus officialisatnt the military role of the Tower. 1925: After a first broadcasting experience (1921) and the installation of a temporary studio in the North Pillar (1922) Mr Privat begins in the "spoken newspaper", the first radio show. 1935: Installation of a television transmitter at the top of the tower and 1st transmission. From 60 lines at the beginning we go to 441 lines in 1945. 2000: The tower reaches 324m after the work done by TDF on the UHF antenna. 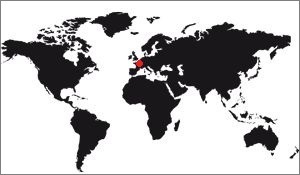 The current 120 antennas allow the diffusion on Paris and Ile-de-France of 41 television channels and 32 radio stations. In several places in the lower room there are illuminated panels with some pictures from the late nineteenth and early twentieth centuries, sometimes even more recently. We see for example the engineers who designed the tower, Gustave Eiffel the contractor, the architect Sauvestre, Emile Nouguier, the designer, etc. There are panels presenting the great of this World who came to visit the tower during the World Fair of 1889, with Buffalo Bill, the Shah of Persia Nasser-Eddin, the king of the Nallous and his family Dinah Salifou, the tzarevitch Nicola II, the Spanish kidney Isabelle II, etc. Another light panel shows the scintifical experiences that have been made on the tower. They were the ones who saved the monument, which was to be destroyed in 1909. But as the army had found a military interest, it was kept. But this interest was the boom in television broadcasting, which began here, during an interesting radio link between the 3rd floor of the tower and the Pantheon. All these panels are visible in the 3rd floor room, there are none on the galleries. 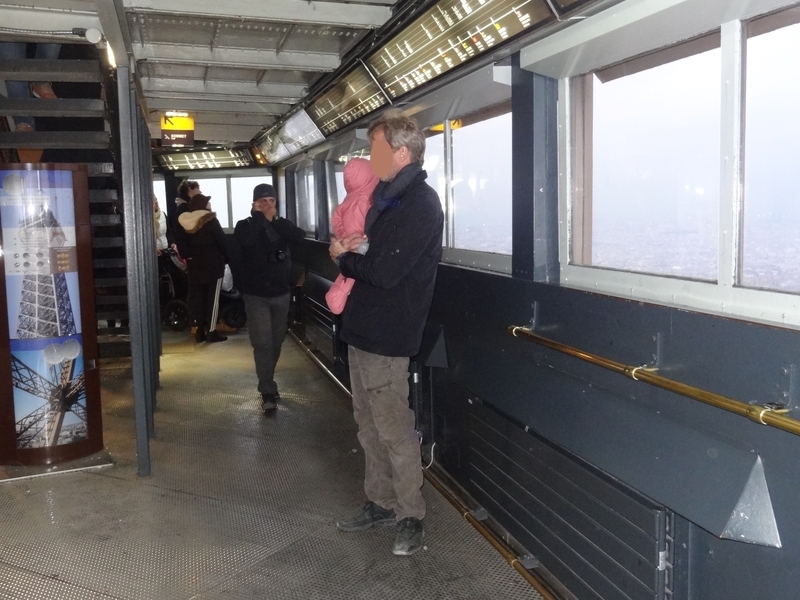 All these are not the only things to see on the 3rd floor of the Eiffel Tower. There is also a sign explaining how the inauguration of the tower took place, in 1889, the opportunity to see up close the technical installations at the top of the tower, the stairs going up to Mr Eiffel's office, the lightning conductors that go around the building, etc.